We can’t accommodate pups at the Center on a regular basis, but we promise we love those wagging tails and slobbery tongues! So we’ve carved out a weekend for fur + flowers. Grab your canine bestie and head our way for fun, fur-baby-friendly activities. 10 a.m. – 1 p.m.: Pronouncing words aloud can be scary for new readers. Divine Canines Barking Book Buddies will help children pick up a book and read to a patient, furry friend to gain confidence. 10 a.m.: Dogs on the lawn (it’s yoga with your dog! ); bring a mat or towel. 10 a.m. – 1 p.m.: Pronouncing words aloud can be scary for new readers. Divine Canines Barking Book Buddies will help children pick up a book and read to a patient furry friend to gain confidence. No Bones About It: These are the rules! Dogs must be leashed at all times and remain on marked trails. We expect a lot of visitors. Please bring only well-behaved, socialized dogs. Leashes must be no longer than 6 feet. Retractable leashes are not permitted. Dogs are not allowed in Wildflower Café. Outdoor seating is available. Dogs may not enter any of the water features or ponds. Keep those paws and noses safe! Stay on the trail. Dogs must be up-to-date on vaccinations and registration. Handlers must pick up after their dogs and properly dispose of waste. 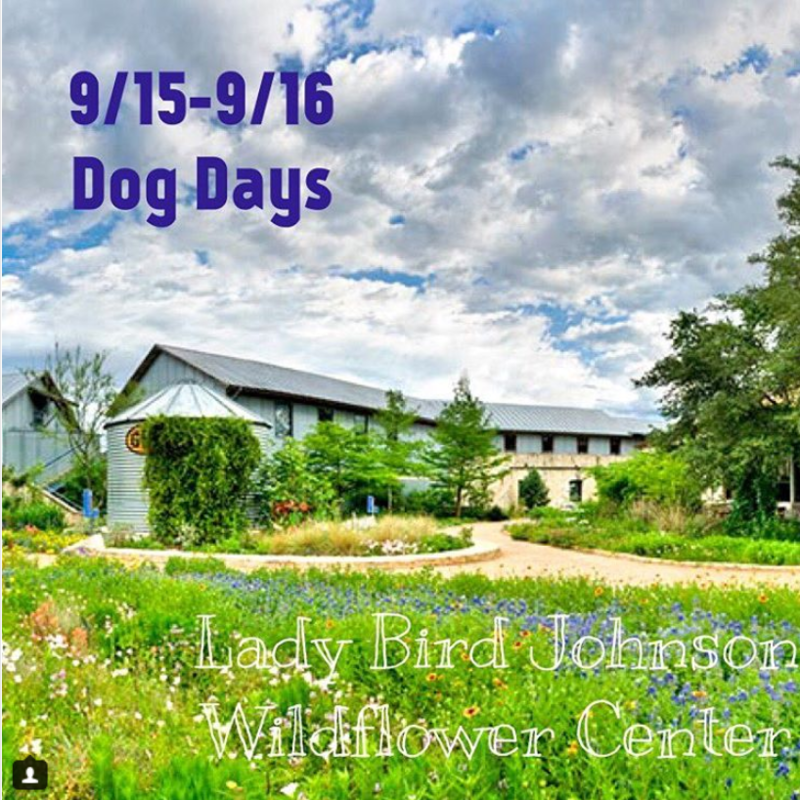 The Wildflower Center reserves the right to refuse entry to or remove any dog thought to be dangerous to other dogs or visitors. All dogs older than one year must be spayed or neutered. Please do not bring an animal that is in heat. The Wildflower Center is not responsible for any injury or illness. Each dog owner is responsible for their own dog. If your dog causes damage to any person or property, you are responsible. An adult (16 years old and up) must maintain control of each dog’s leash at all times — limited to two dogs per handler. Please ask before approaching or allowing your dog to approach an unfamiliar human or dog. Dogs are the only companion animals permitted for this event. Thank you to our sponsor, Woof Gang Bakery!